The dormant Thrihnukagigur Volcano last erupted over 4.000 years ago. 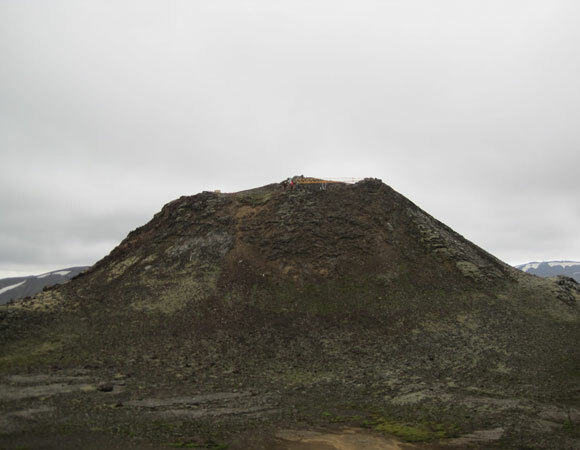 The volcano’s name would be directly translated to English as "Three Peaks Crater" and is located about 20 km southeast of Reykjavik. In May of 2008, UNAVCO loaned two Terrestrial Laser Scanners (TLS) to Professors Sridhar Anandakrishnan and Pete La Femina of Pennsylvania State University for their field course in Iceland. 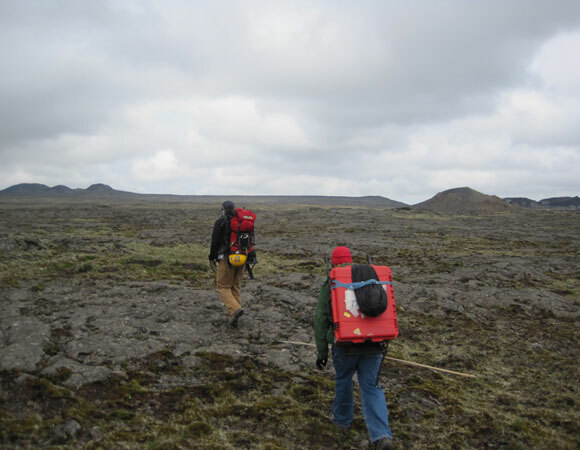 Icelandic landscapes are marked by a wide variety of geological features, such as volcanoes, glaciers, and the Mid-Atlantic Ridge, which make for a complex and exciting setting for students to conduct field studies for their senior theses and to learn about field techniques with instruments such as the TLS. The class generated scans of the various land forms such as dikes, fissures, glaciers, columnar joints, and quarries. 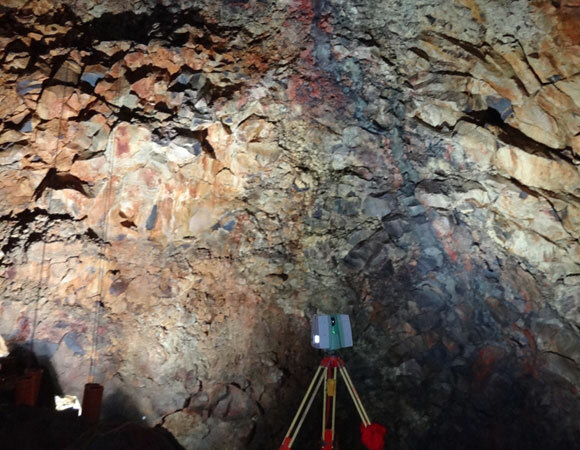 These scans have proved to be instrumental in learning about potential uses for the instrument, and its capabilities in different environments and settings. In late June of 2012, UNAVCO provided continued support for Dr. LaFemina with a second TLS survey campaign in Iceland. A Leica C10 scanner was used to scan the inner chamber, shaft and surrounding area above the Thrihnukagigur Volcano. Over the course of 7 days, 18 scan positions were occupied and over 500 million points collected. 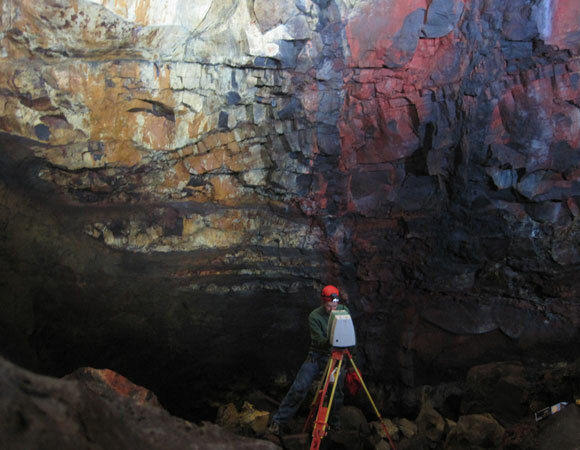 In comparison, previous surveys of the magma chamber using land-surveying equipment produced only 1200 points. Figure 1. Leica C10 TLS scanning the lower shaft. Photo by Halldor Geirsson. Figure 2. 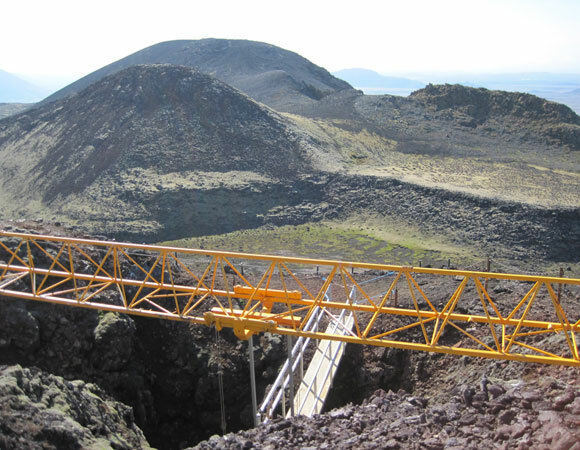 Thrihnukagigur Volcano, with yellow elevator support beam in view. Photo by Halldor Geirsson. Figure 3. 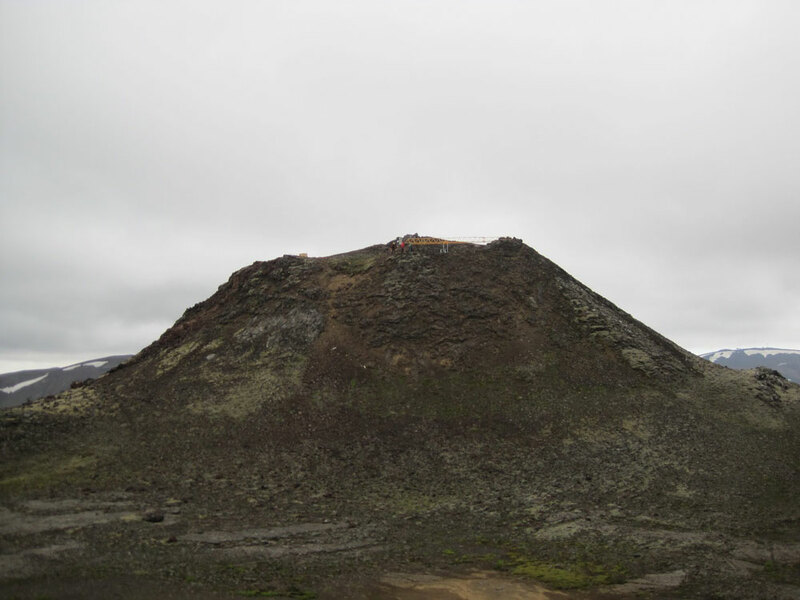 The 40 minute hike to Thrihnukagigur Volcano. The volcano is the 3rd one from the left. Photo by Jim Normandeau. Figure 4. 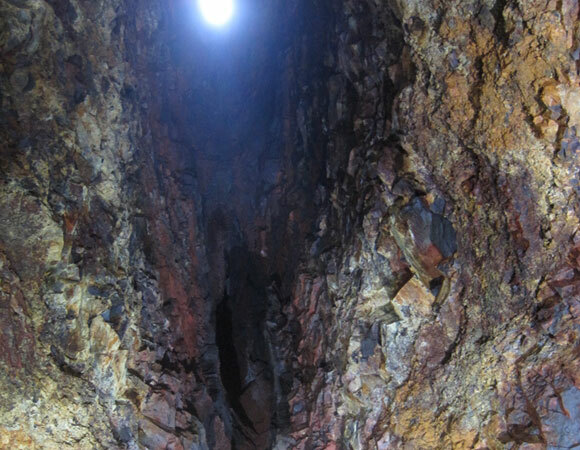 The Thrihnukagigur Volcano elevator. Descends 120m to the chamber floor. Photo by Jim Normandeau. Figure 5. 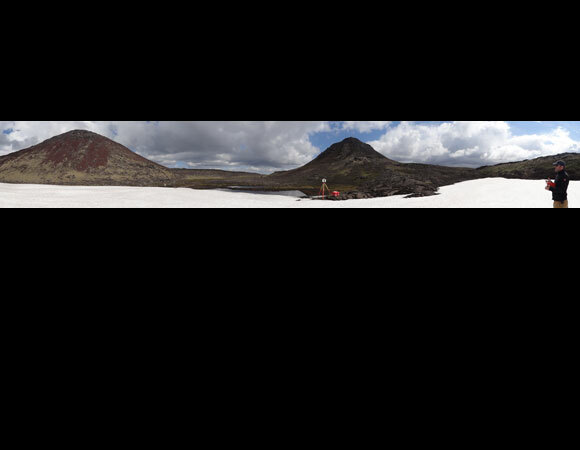 Panoramic of the Thrihnukagigur Volcano. Photo by Jim Normandeau. Figure 61. Thrihnukagigur Volcano dike. First scan position. Photo by Jim Normandeau. Figure 7. 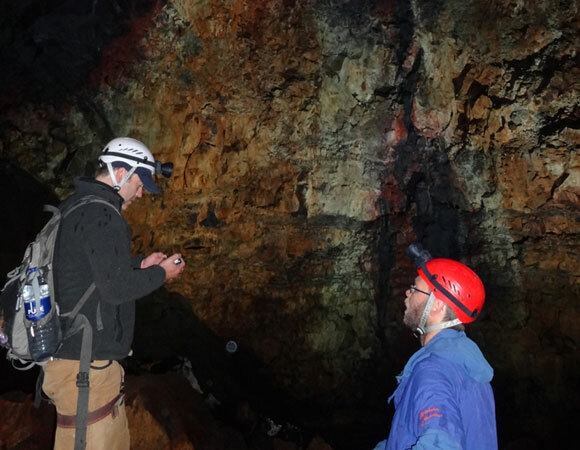 Peter LaFemina and Halldor Geirsson discussing the intricacies of the Thrihnukagigur Volcano magma chamber. Photo by Jim Normandeau. Figure 8. 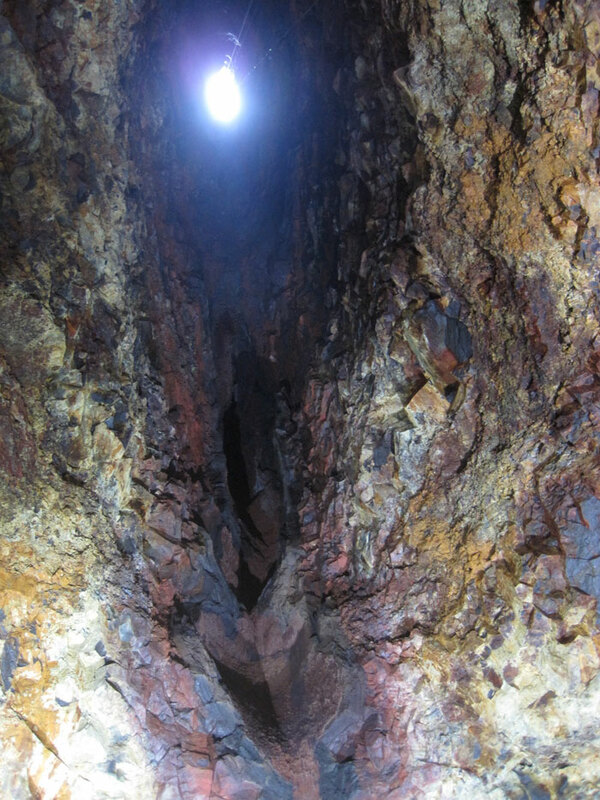 View from the bottom of the magma chamber looking up the shaft. Photo by Halldor Geirsson. Figure 9. Jim Normandeau preparing to scan another 60,000,000 points. Photo by Peter LaFemina. 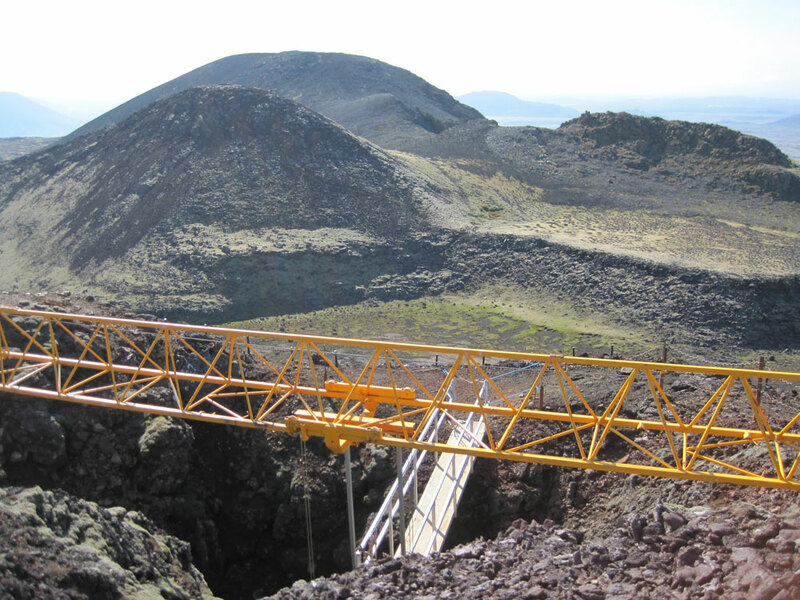 The equipment had to be hiked in over old lava fields to the entrance of the volcano. One toe was broken during a fall. 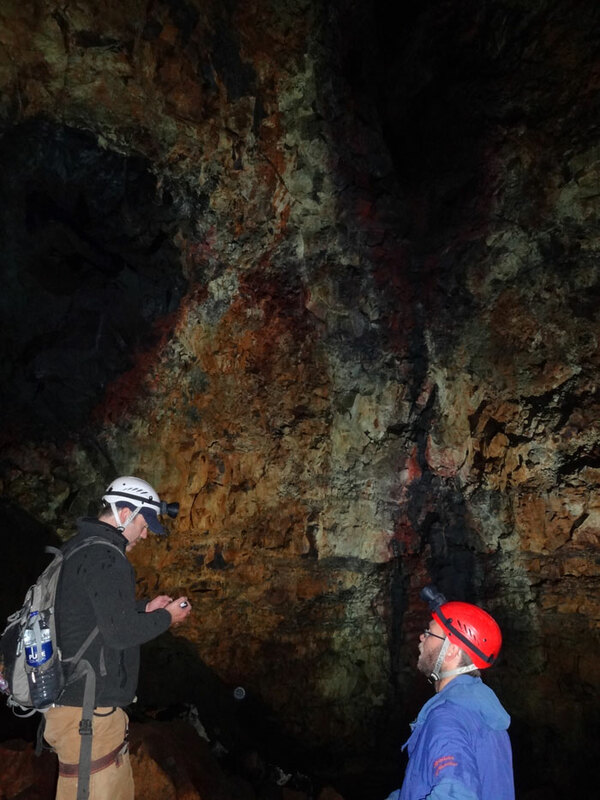 Once at the entrance, the TLS crew had to be lowered by a swing stage (aka window washing platform) 120 meters down into the magma chamber. The temperature inside the chamber was a constant 42º F. Another challenge was measuring the shaft. After being given the keys to the swing stage, the TLS crew lowered themselves 1/4 and then 3/4 of the way down the shaft. By carefully securing the stage against the shaft wall with poles, the platform was made stable enough to do 2 quick scans. 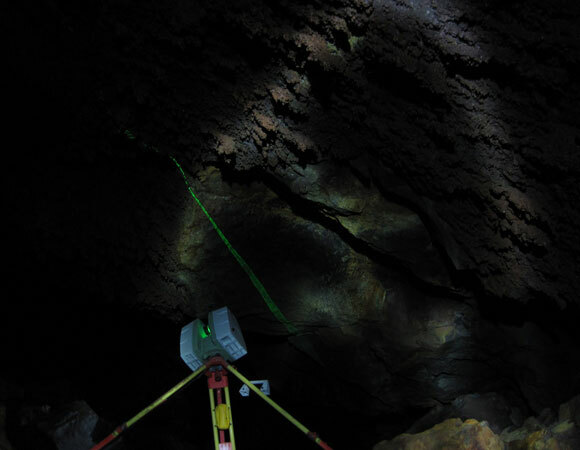 With no way to properly set up targets in the shaft, there was no easy method to accurately combine the magma chamber point cloud with the shaft point cloud. 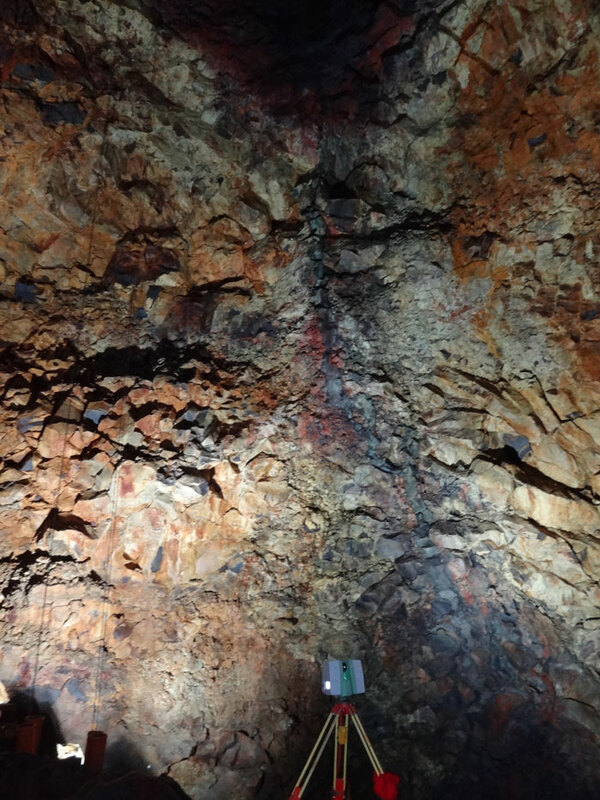 Fortunately, the beam that is used to support the swing stage was visible from the magma chamber. Using several points on this beam allowed for a cloud-to-cloud registration of the data.